We celebrated 15 years of successful business in 2017. We have many satisfied customers, great suppliers and a dedicated team of staff. Owner, Steve Tomkins has a degree in Agriculture from Reading University. He spent some time working on both conventional and organic farms before becoming involved with marketing organic fresh produce. He gained experience working with two different companies before combining with long-standing friend Geoff Mutton to form Phoenix Organics. Owner, Geoff Mutton has a diploma in Commercial Horticulture from Pershore College of Horticulture, ran an organic market garden and herb nursery for over 20 years. 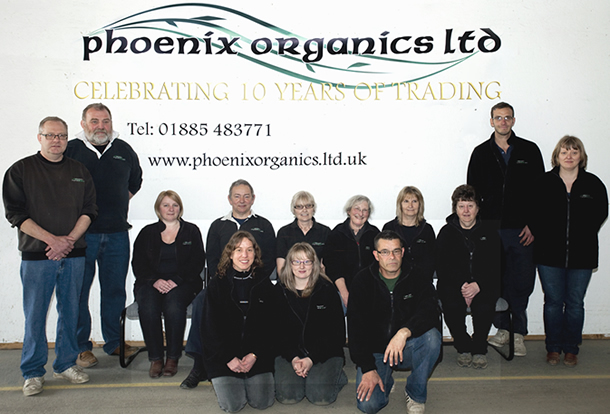 He has served on various Soil Association Committees and worked for 10 years marketing organic fresh produce before the start of Phoenix. In the Depot: Ian (Depot Manager) with Steve (Smithy), Nick, Dave and several other staff lending a hand at busy times. Our Drivers: Tim, along with most Depot staff who double up as drivers when needed. Most staff have been with us for several years and during that time have worked in many aspects of our work. We believe that this approach enables everyone to understand what is required in each part of the business and helps to provide a better service to our customers. Here at Phoenix, we recognise that in order to be a successful business, satisfying our customers’ needs, we need to have happy, contented and informed staff. Despite the inevitable stresses and strains of the fresh produce market, our staff will always try to remain cheerful, courteous and helpful. We trust that this ensures dealing with Phoenix is always a satisfactory and rewarding experience.